Daubigny was one of the foremost painters of the Barbizon school, a group of French artists active from the 1830s who celebrated the French landscape in their paintings during a period of unbridled industrialization and urbanization. He was a close colleague of other members of the famous group, in particular Corot, although in fact he seldom painted around Barbizon––which is a small village on the northern edge of the Fontainebleau forest. 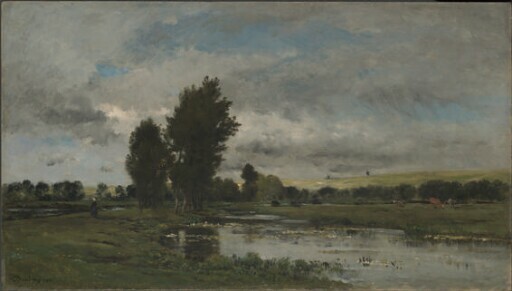 Daubigny began to exhibit landscapes at the Paris Salons in 1838, but earned his living mostly as an etcher, often providing illustrations for books. His success as a painter began around 1850, when he won acclaim for his river views, despite his unconventionally sketchy handling of paint. Already by the late 1850s, Daubigny’s works were referred to as “impressions,” because they lacked the sort of careful finish that was standard before the advent of Impressionism in the 1870s. In 1857 Daubigny launched a studio boat as a way of easing the problems of transporting supplies, which, as an out-of-doors painter, he faced on his expeditions to work directly from nature. Monet, who would launch a studio boat of his own in 1873, kept a small landscape by Daubigny on his studio wall for inspiration when he began his career. It was Daubigny, moreover, who promoted Monet and Pissarro when all three artists sought asylum in London during the Franco-Prussian War. The Kimbell landscape, painted in the summer of 1871, is an exquisite example of Daubigny’s influential style. It shows a view along the Oise River, not far from the artist’s home in Auvers. The wind-swept clouds, rendered with accents of impasto, animate the quiet, mirroring surface of the river, dotted with water lilies, with the sort of nature poetry that would become the essence of Impressionism. purchased by Kimbell Art Foundation, Fort Worth, 1969.